Anywhere you need a waterproof nautical-look flooring NautikFlor is your answer. While developed for use on interior ship and boat floors, NautikFlor quickly was snapped up for use in boat brokerage offices, bars, verandahs and patios, marina offices, boat yard offices and the like. The patented locking clip-together technology allows for fast installation saving you labour costs and allows the system to be installed as a floating or glue-down floor. Each board is 1.2m long by 0.2m wide making a total of 0.25 square meters per board. Total thickness is 5.5mm which includes 1mm of insulating foam on the underside. 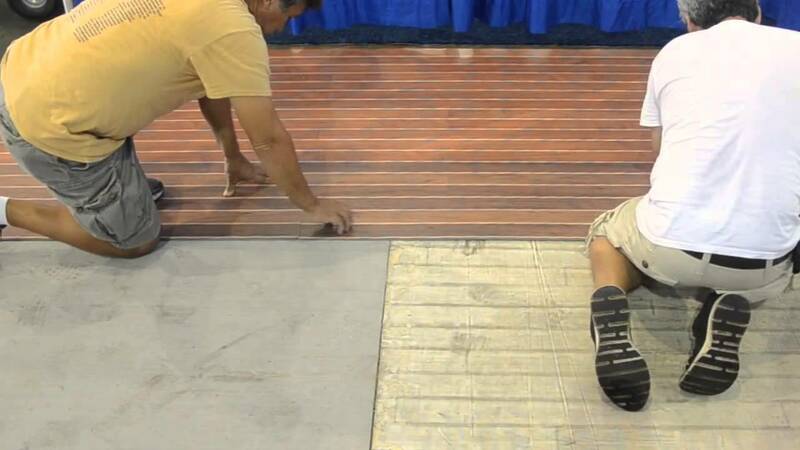 Made from lightweight, waterproof marine grade PVC, you can leave this floor in water all day, and unlike a laminate or real timber floor, it will not swell, discolour or rot. Nautikflor resists stains, odours and mould making it easy to clean...far easier than a marine carpet. One very unique feature of NautikFlor is the ability for us to have your company logo, boat name or any other graphical creation such as a compass rose digitally printed into your new floor. This is a fantastic opportunity for cruise vessels through to marina offices to proudly display their logo in what looks like a high-cost timber inlay pattern on the floor. NautikFlor is sold by the board, and is $73.85 per board ($299/m2) including GST. Please click on the image from above to select your preferred colour choice and purchase. The American Cherry and white or black strip NautikFlor is a great choice if you have cherry already on the inside of your vessel or are after a slightly reddish tinge in the wood, and want the strips to really give a nautical look to your floor. Samples are also available to allow you to see the product prior to purchase. Please contact us for option of installation.